The Guardian and a couple of partners have declared November 19th #LoveTheatre Day. One of those partners is Twitter UK, which is the reason for the hashtag. It’s a day of celebrating theatre on twitter. • #BackStage (10am-12pm) will offer audiences and other arts professionals a glimpse into how a production comes together in the weeks and months leading up to the big night. • #AskATheatre (3-5pm) will offer a unique opportunity for theatre aficionados and aspiring actors to hear first-hand from the individuals and groups that make the magic happen. • #Showtime (7-10pm) will give those who can’t make it to a theatre the chance to sit in the “virtual stalls” to experience the a performance, or several, via Twitter. Some Irish theatre companies are taking part as well. The Lir tweeted some #BackStage photos and videos this morning, Pat Kinavin and Jim Culleton were answering questions on the Fishamble twitter, the Abbey are retweeting favourite theatre moments and The Everyman is answering questions. 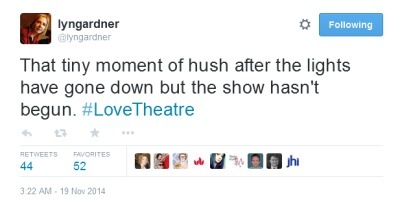 The Guardian are collecting tweets here and their theatre critic Lyn Garner has tweeted some of her favourite moments. It’s a nice idea – I’m in favour of celebrating theatre and hopefully the tweets will encourage people to book a ticket and see a show. The best way to #LoveTheatre is to go see something!